Easily my favorite version of Red Robin. That cowl is just badass. Flawless job, btw. I love it! 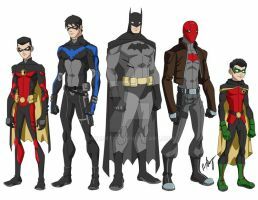 I love the concept...I have always liked cowls. dude...new nightwing costume was EPIC i dug it a lot. and now that we know season 2 has brought on tim drake, who knows where this show might go, we may see red robin at some point now! HUGE awesome first episode. im waiting on donna troy, i want her to show up so bad. Wow. I'm a huge Batman and Robin fan so thumbs up x10 for the idea. Execution is perfect as well, if I'd seen this without your info I would've thought it was appearing in Young Justice for real haha. Great work for a photo maniulation. You drew this? It's fantastic!!! its a photoshop manip using batman and robin from young justice. Well it looks awesome! I find it nearly impossible to use photoshop as a manip tool and make the final image look decent!